As a diabetic you are likely to monitor your blood sugar regularly. Here are some blood testing tips. 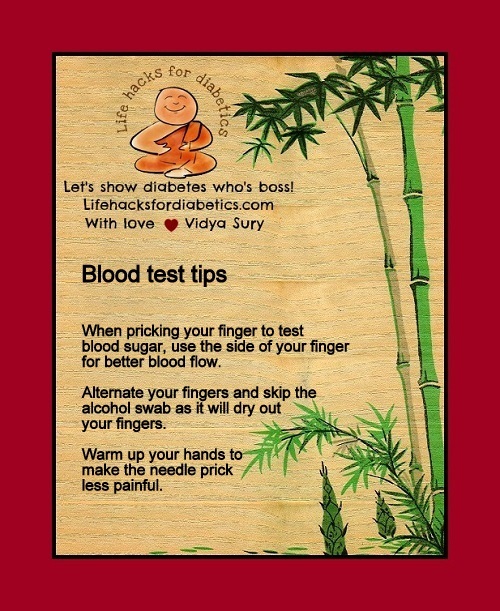 When pricking your finger to test blood sugar, use the side of your finger for better blood flow. Alternate your fingers and skip the alcohol swab as it will dry out your fingers. Warm up your hands to make the needle prick less painful. Informative post, Vidya. Thank you for sharing. I’m lucky not to suffer with diabetes although my husband’s family do. Wishing you a healthy and happy day. Thank you Nicola! I wish you health! Thanks for this post challenge series. Just diagnosed and bummed! Awww Sharon! Thanks! I went through the why-me phase before I shook myself up and took action to manage it. Hugs! I’m stopping by from the #AtoZChallenge. I am a diabetic in the US and have signed up for your blog posts. What a great service you provide…thank you! I used to be an educator for recently diagnosed diabetics. If you are taking your bs in the am be sure to move around for several minutes to get your blood moving, drink an 8oz glass of water, squeeze the finger that you are taking the blood from (to warm it and get the blood moving). Your results can be 30 to 50 pts lower. If you are taking metered doses of insulin this can be a significant difference. That’s great advice Moon! Thank you! I follow what you said – I had read that in a forum long ago and yes, it works.